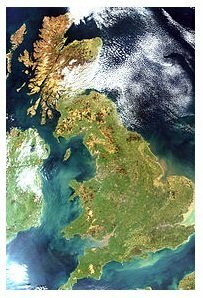 Great Britain is a large island off the Western coast of Europe. It is a combination of the territories of England, Scotland, and Wales. Since the 18th Century, it has been known as the United Kingdom, or simply U.K. The United Kingdom is such a tiny little place, in the scheme of the map of the World. One might think it quite insignificant. However, since the late Middle Ages, when it began to emerge as one of the major maritime powers, this little island kingdom has had a greater influence on the history of the World than any other country on the face of this vast planet. During the 18th and 19th Centuries, they embarked on a massive program of colonial expansion, establishing colonies on every continent and in every ocean. By the beginning of the 20th Century the British Empire was the largest empire on earth. The famous saying was absolutely true, that "THE SUN NEVER SET ON THE BRITISH EMPIRE". Even today, many countries around the globe owe their cultures, civil laws, and even their languages to Britain, including the United States. Postal systems have existed for over 2,000 years. The earliest systems generally involved couriers delivering government or military communications over great distances. Letter mail came into use in the Middle Ages, and by the 17th Century, some towns began using postmarks to identify the place or origin and the date the letter was mailed. The postal fees were always paid by the recipient, upon the receipt of the letter. "Stamps" have been around since the Middle Ages, though they were primarily tax stamps, embossed on legal or financial transaction documents. In the 1830's, Great Britain began studying the idea of implementing inexpensive letter postage rates that would be prepaid by the sender with an adhesive postage stamp at the point of origin of the letter. On May 6, 1840, Britain became the first country in the world to issue adhesive stamps, for the prepayment of postage, to be affixed to the letter envelope by the sender. The new stamps featured the portrait of the twenty-one-year-old Queen Victoria. They are shown in the image above. As no other country at the time was issuing adhesive postage stamps, the country name was not used. For their distinction of being the first stamp issuing country, to this day, Great Britain is the only country in the World that is NOT required to print their country name on their postage stamps. From the specialist willing to spend the hundreds of thousands of dollars required for a specialized Victorian collection, to the general collector buying sets of modern commemorative or definitive stamps, there are many possibilities for collecting the stamps of Great Britain. For the novice collector, a basic collection of used 19th Century issues, such as the Penny Reds or the less expensive Surface Printed stamps, is possible for a modest investment. A great starting point for new collectors of Great Britain stamps may be all the mint stamps from the coronation of King George VI in 1937 to modern times. Collecting this period can give the new collector many hours of enjoyment, a great looking historical collection, and the cost of all the stamps will not break the budgets of most dedicated stamp collectors. The nineteenth Century postage stamps of Great Britain are very complex. Most specialists prefer to use the Stanley Gibbons Great Britain Specialised Catalog, Volume I. The stamps of Queen Victoria's reign are separated into three major groups .... Line Engraved Issues, Embossed Issues, and Surface Printed Issues. These categories will be used for this website's 19th Century content page links, though the stamps within them will be illustrated and reviewed in Scott Standard Postage Stamp Catalogue number sequence. The most complex area of 19th Century British philately is that of the Line Engraved Issues. This group includes the Penny Black, Penny Reds, and the Two Pence Blues. There are philatelists that spend their entire lifetimes working on this one area. There are literally thousands of varieties. Twentieth Century postage stamps will be presented as Definitives and Commemoratives pages for each monarch. They will all be illustrated and reviewed in their Scott Standard Postage Stamp Catelogue sequence. For the specialist, the issues of King Edward VII and King George V can be a bit complex, as there are many variations that are not sufficiently detailed in the Scott catalogs. For specializing in this area, it is strongly recommended that one use the Stanley Gibbons Great Britain Specialised Catalogue, Volume 2 -- King Edward VII to King George VI. In my 1980 edition, the analysis of the issues of King Edward VII and King George V take-up the first 240 pages of the book! On the Penny denomination British stamps, why is the symbol for Penny "d." ? One must remember that Britannia was an Ancient Roman province for almost 500 years! The economy there was based on the Roman currency system. Their major unit of Roman currency was the silver Denarius. There were 12 silver Denarii to a Roman gold Solidus. In manufacturing, 240 Denarii could be cut from a one pound silver bar, known as a "libra" (Livre in France, Peso in Spain, etc.). Thus 240 Denarii were equal to one "pound" of silver, under the Roman monetary system. The weight and fineness of the Roman currency was very important to the Roman Empire, and only the Emperor had the authority to change it. Anyone intentionally changing the weight or fineness of the coins was immediately put to death. In early Medieval England, the Penny was a very thin silver coin, about the size of a US Dime. Early English pennies were measured at 240 to a "Pound" of silver. Merchants often clipped them to amass extra silver, and sometimes dishonest mint officials would change the weight or fineness of the coins. The only person authorized to make changes in the weight or fineness of the coinage was the King, and people practicing these activities were guilty of High Treason. The Denarius became a Penny, The Solidus became a Shilling, and Two hundred forty Pennies became a Pound Sterling. The symbol for Pound .... ₤ .... is actually an abbreviation of the Latin word "Libra". 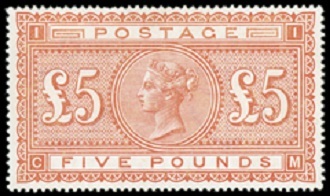 The abbreviation "P" for "Penny" is used in all the category and content pages on this website, where the stamps are denominated in Pounds Sterling. It does seem a bit unusual that the denomination on United Kingdom and British Imperial postage stamps has always been abbreviated as "d" for "denarium", yet the denomination on United Kingdom coins has always been expressed as "PENNY" or "PENCE". The proper way to express ONE POUND is "₤ 1" and NOT "1 ₤". In this website, if it is expressed in the latter way, it is usually for aesthetic purposes, in an effort to left-align the denomination columns evenly.